After a five-year studio hiatus, the Fratellis return in a big way with their third album, We Need Medicine, to be released October 8th. Front and center is "This Old Ghost Town," an urgent and exhilarating shot of rock & roll, which premieres here, right on the heels of the Glaswegian trio's uplifting new single, "Seven Nights Seven Days." 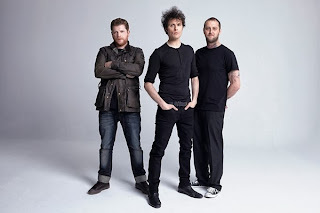 "The only reason for the song to exist was to give a home to a mariachi trumpet line I'd dreamt up," frontman Jon Fratelli says of "This Old Ghost Town." "To play this song loud is to have as much fun as it's legal to have in most states, I'd imagine." Speaking of states, the Fratellis will launch a U.S. tour in New York on November 1st in support of We Need Medicine.